When it comes to heart health, carrots alone provide soluble fiber, potassium, and vitamin B6. In this recipe, the addition of olive oil and garlic makes it that much more potent. Just another way to enjoy one of our all-time favorite vegetables! Tear a large piece of aluminum foil, about 24″ long. Spread the carrots out evenly over one half. Sprinkle with the vinegar, rosemary, garlic, and paprika. Season with optional salt and pepper. Drizzle with the olive oil and fold the opposite end over, folding around the edges to make a neat package with no openings. 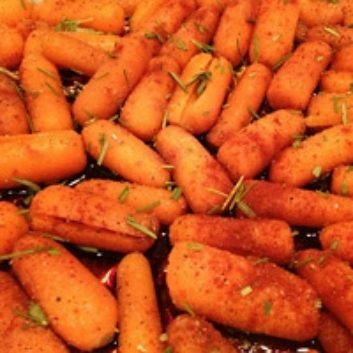 Place the package on a baking sheet and bake 20 to 25 minutes, until the carrots are tender when pierced with a knife. Serve immediately.